We summarize and theorize the cases of business activities in the Japanese competition market with business or academic leaders, and apply those cases to the educational business curriculums. 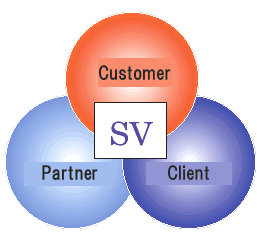 Taking advantage of IT tools and our marketing activities, we update the cases and revolve "practice and theory" to　offer immediate effective strategies to help satisfy corporate customers' needs and solve global business issues. …Major corporations, national or local governments, partner organizations and educational institutions planning to introduce IT tools or strengthen business operating systems. 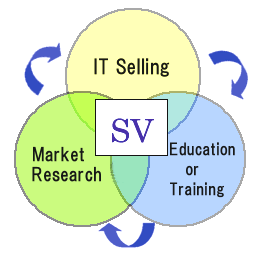 SV will play a significant role as a good mediator to serve the wonderful IT new softwares or hardwares or educational research programs for corporations at reasonable prices.